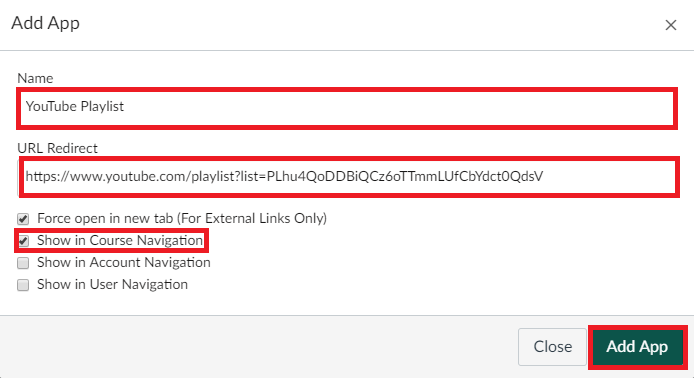 How to create a link in Canvas course menu? The Redirect Tool app in Canvas can help you create links to external web resources (a research database, a YouTube playlist) that show up as navigation items on the left-hand side of your course page. 1. Click Settings on your course page. 3. Search for Redirect Tool in the search bar. 4. Click on the picture of the Redirect Tool. 6. Choose a name for the link you want to add to the navigation bar of your course. 7. Insert the URL for the website desired. 8. Click on Show in Course Navigation. 10. Refresh the web page and the tool is now available in the course. 3. Click View App Configurations. 4. Find the link you wish to remove. 5. Click the Settings gear wheel next to the name. 7. Refresh the page and the link will not show up on the navigation menu.